Update as of 15 May 2004 - the triple stuff has all gone to a new home. 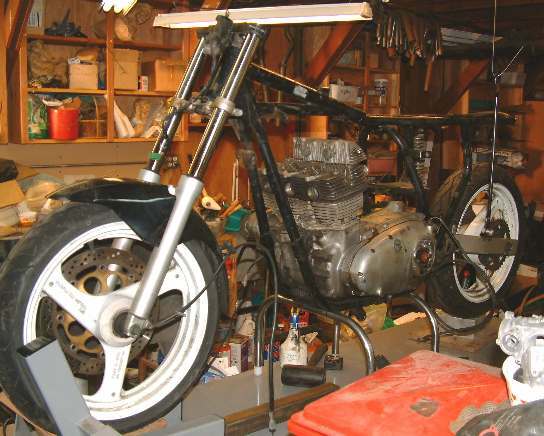 I've realized that I've accumulated far too many project bikes and the triples were waaaaay down the "work on during the next decade" project list. If I should buy one in the future I'll probably go with a nice runner instead of a severe basket case. 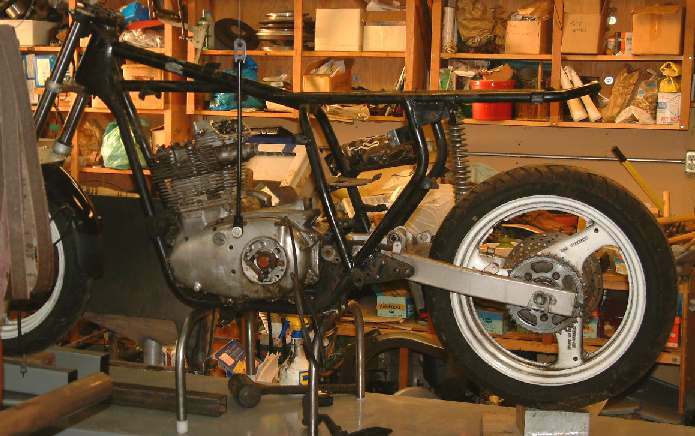 Update as of 16 March 2003 - Several weeks back I picked up a complete front end and rear end from a Suzuki GS500 twin. 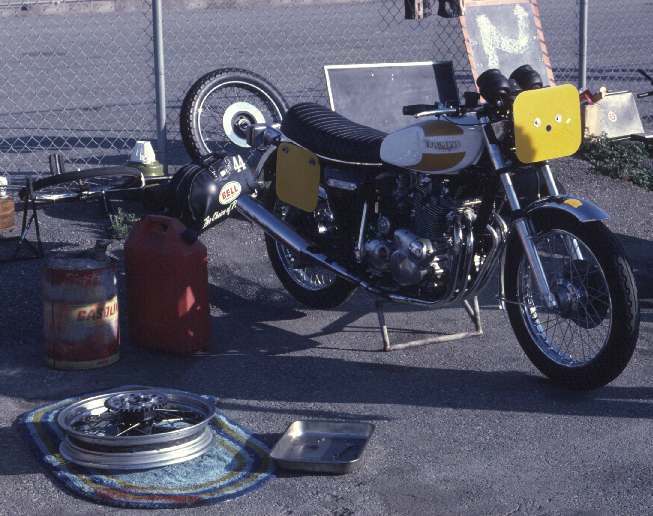 As you'll recall, the R3 came without wheels/forks or much of anything else, and I couldn't see putting on stock wheels on with 19" tires and inadequate drum brakes. The problem is getting the chain to clear the tire. 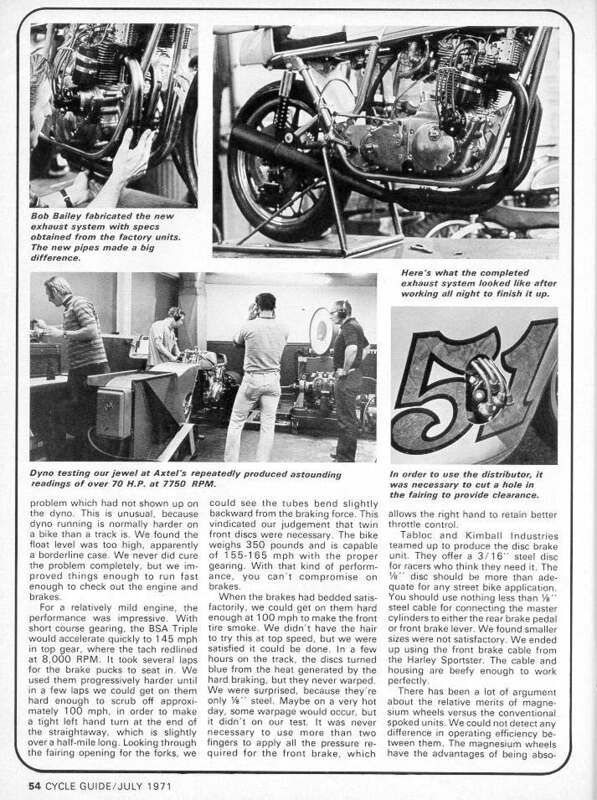 BSA/Triumph didn't see any reason to move the chain farther from the centerline of the bike, and it appeared that if I converted to 520 chain by shaving .125" off the inside of the countershaft sprocket I'd end up with the inside of the sprocket just even with the outside edge of the 130 tire on the 3.5" x 17" rear wheel. 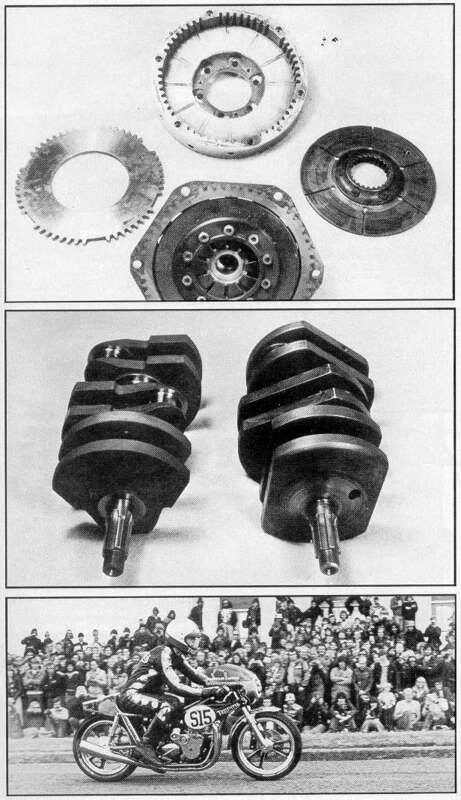 Offset countershaft sprockets are available from Philip Pick for the five speed transmissions, but for right now the R3 is going to stay with the four speed box. 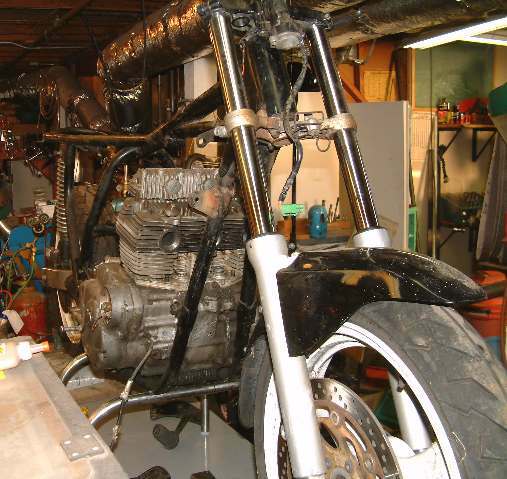 I put the engine back in the frame to try and look some more at the chain line, and noticed that all of the engine mounting spacers were on the primary side of the engine. The thinnest one is 7/16", so I realized that if I swapped the spacers over to the timing side I could move the engine over 7/16". That should give me plenty of room for the chain to clear the tire. 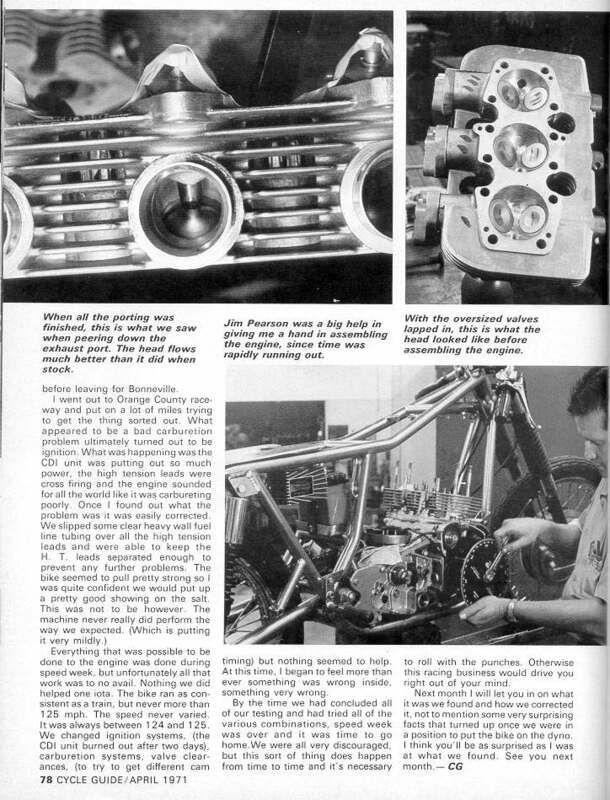 I also noticed that even with the spacers in place there were still air gaps that would be closed only by tightening the motor mounts and bending the frame. I'll make custom-fitted spacers to avoid that problem. 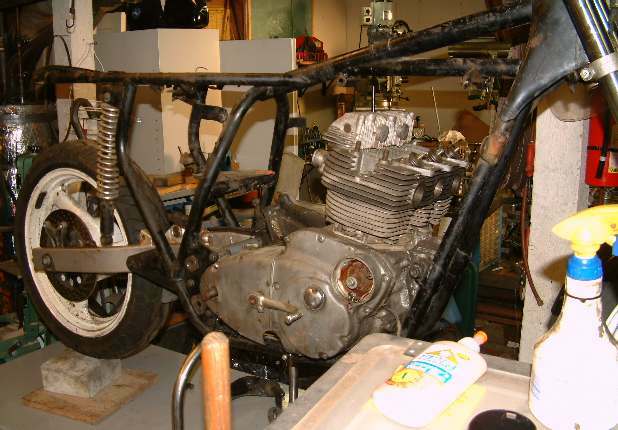 I will have to machine the sprocket carrier for the rear wheel to move the sprocket closer to the center line of the bike. The GS500 swing arm is about 5" longer than the stock R3. 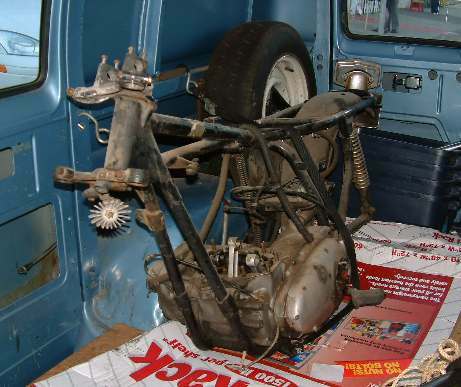 but there is plenty of room at the front to shorten it and weld in a new pivot tube to mate up to the R3 frame. 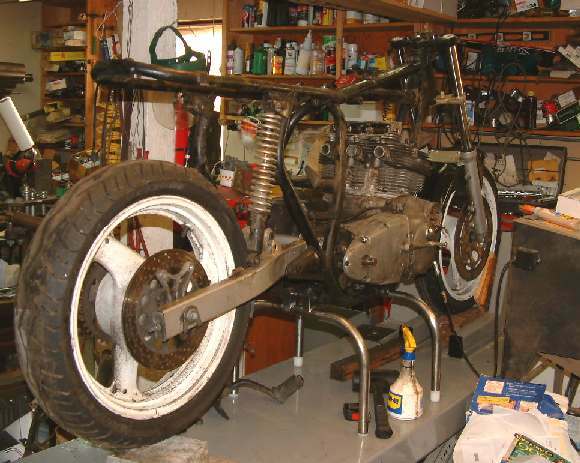 I'm considering running about 1" longer on the swing arm, as I may try steepening the rake a little. 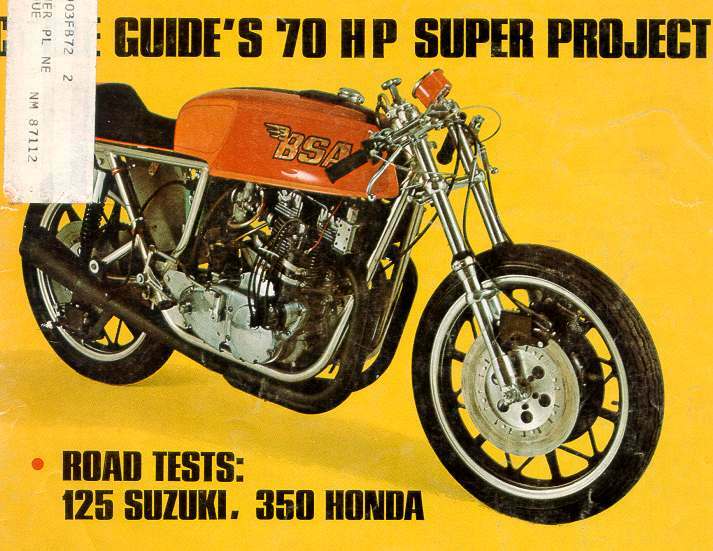 Stock is 28 degrees, and even the "learner bike" GS500 is about 25 degrees. 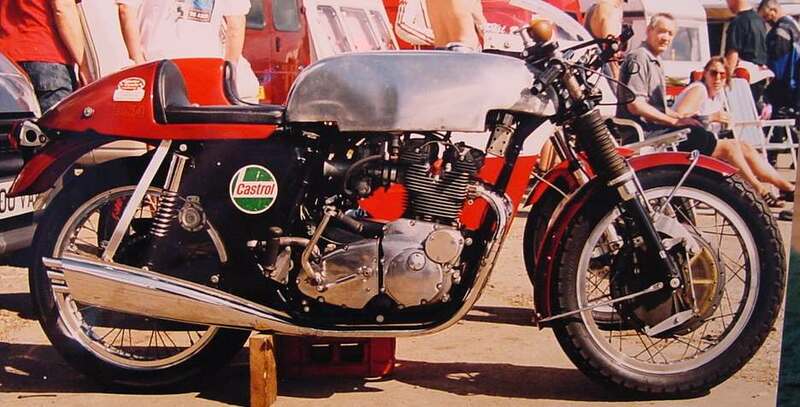 The GS500 forks are 37mm damper rod units, and should be a bit sturdier than the stock 35mm BSA items. 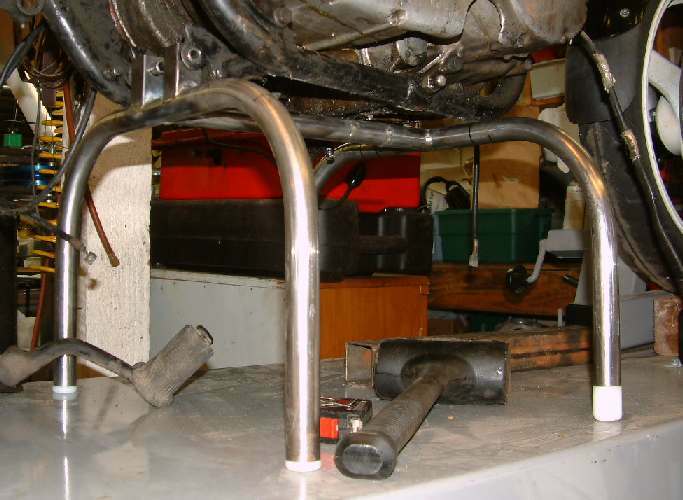 The 60mm x 30mm x 2mm wall rectangular tubing in the GS swing arm should also be stiffer than the stock swing arm. 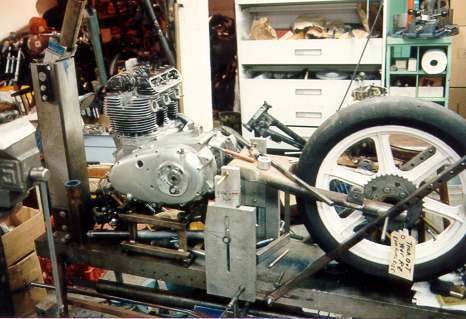 The GS front wheel can be fitted with an additional disc - I haven't gotten to the point yet of deciding what to do on that, and what calipers I'll run. 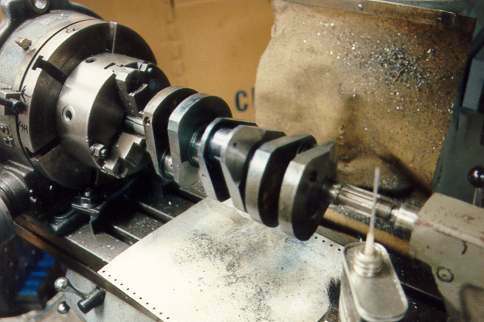 I may end up making new triple clamps with more offset as the GS500 clamps are pretty flat, and I don't want to end up with too much trail, especially if I don't adjust the rake on the R3 frame. 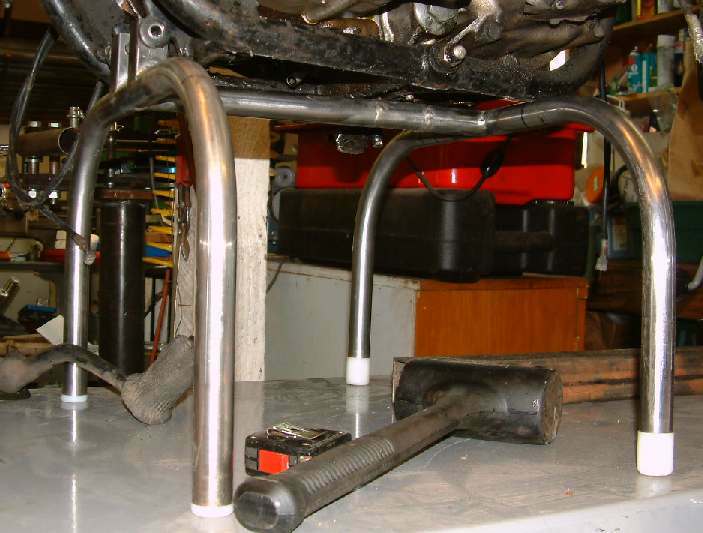 To make it easier to fiddle with the wheels/forks/swing arm I made a stand that attaches to the center stand brackets in the back, and then has the frame resting on the front loop of the stand. I put some UHMW-PE plugs in the ends of the feet so as not to mar the painted surface of my lift. I very carefully determined how far the front loop needed to be placed to make sure it cleared the side stand tab, and when I went to install it found I'd managed to put it exactly under the side stand tab! I cut the connector tube and added a 2" long section of tubing. Even measuring twice and cutting once doesn't always work. The loops are 1" x .049" wall steel tube that I bent with my bender. 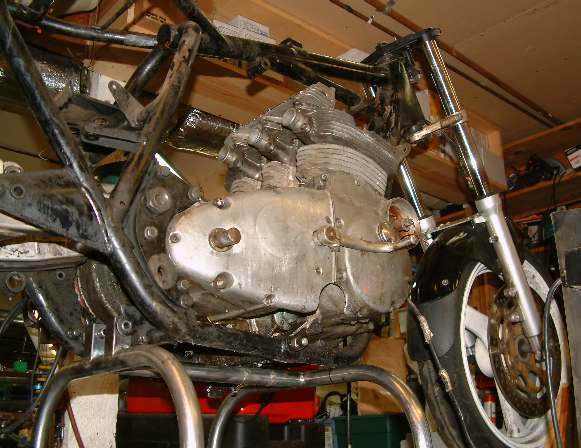 The brackets that pick up the center stand are scraps of 1" x .065" square tubing, and the connector tube is more 1" round. I fillet-brazed the stand together. The R3 basket case arrives home 25 January 2003. The top end is in a box - it came home a couple of weeks ago. 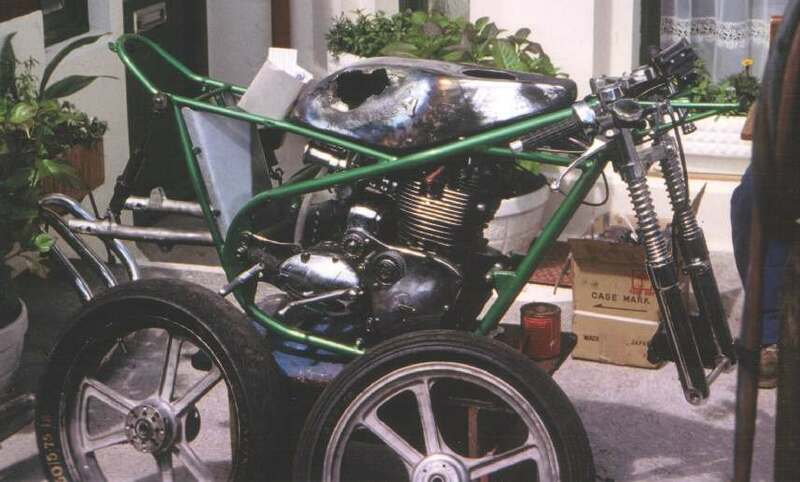 No bodywork other than the rear fender, no wheels, no suspension (rust on the rear damper shafts), no carbs. Why, it's practically a runner! 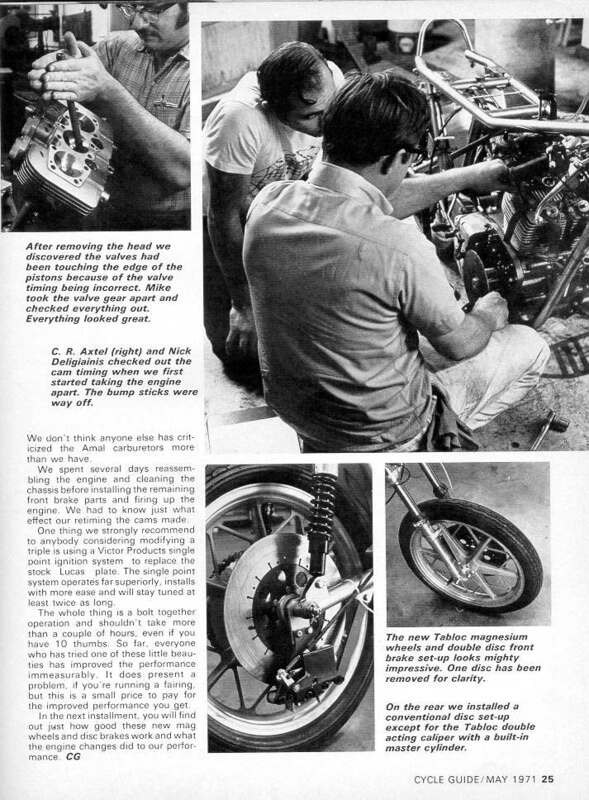 "Cycle Guide" magazine was published by Bob Braverman, and it was one of my favorites because they did a lot of interesting project bikes (often because Bob wanted to go racing on them). 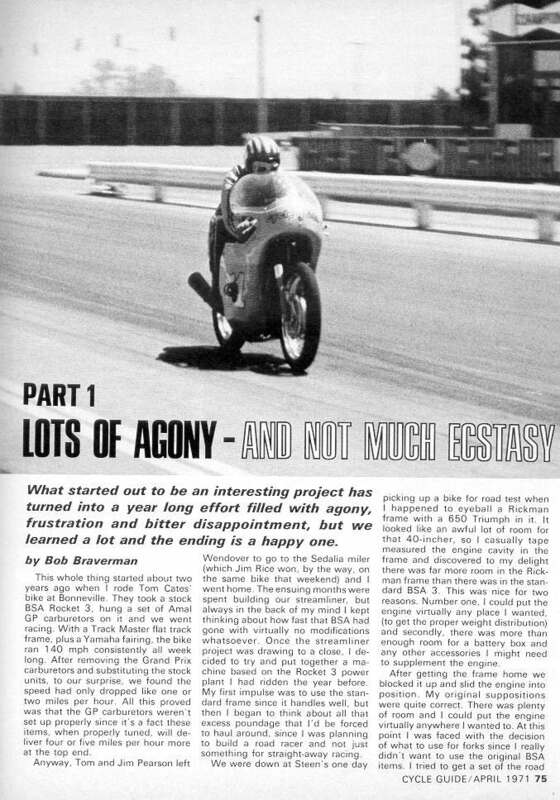 I'm fortunate in that I've not only got a lot of the magazines, but Bob's son Mike Braverman has given me his permission to use whatever material I want from them. 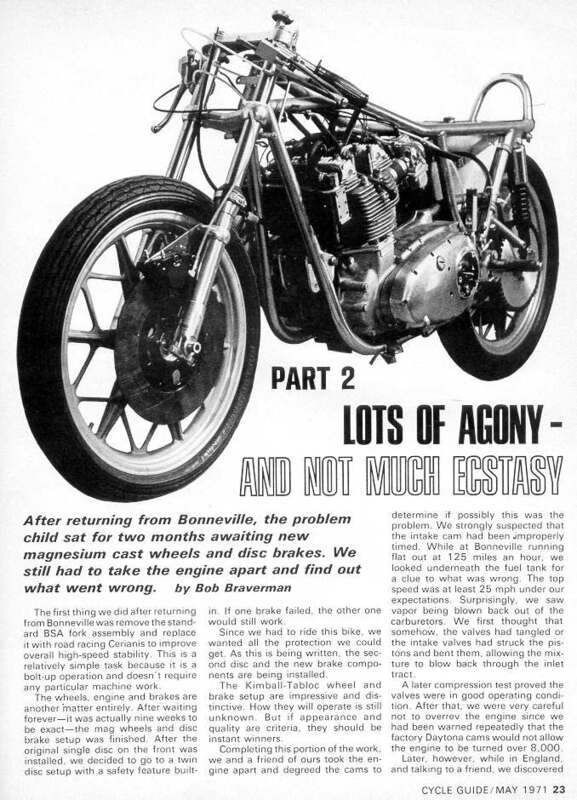 In the April, May and July 1971 issues there was a series of articles called "Lots of agony, and not much ecstasy" documenting Bob's building of a Rocket 3 powered Rickman, which he took to Bonneville and ran at Orange County Raceway. 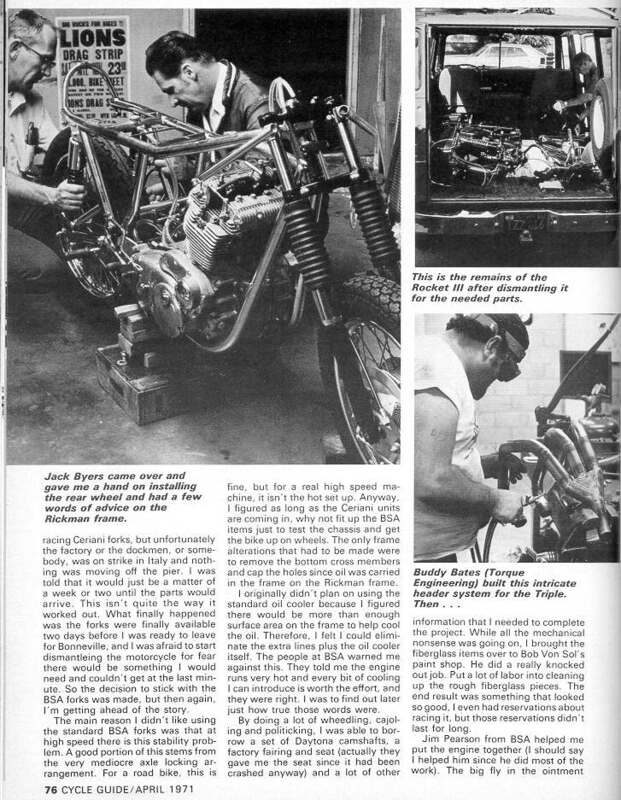 I've scanned the articles and offer them here for your entertainment. As always, I've tried to keep the file sizes small while still maintaining reasonable legibility. 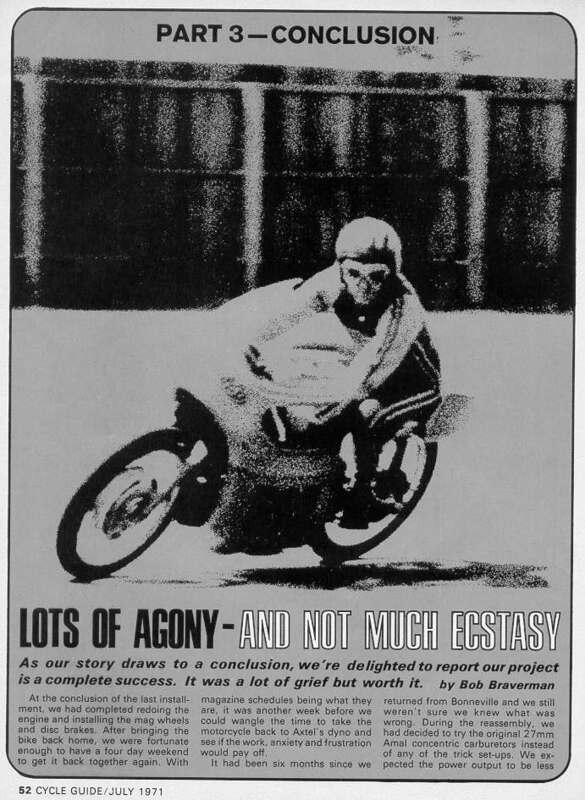 I had a veglia recollection of an article on in an old BIKE magazine about a fellow who built a big Trident for sprints and land speed competition. 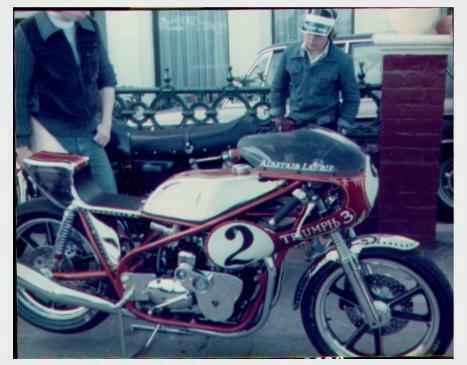 A post to the www.triplesonline.com forum not only jogged my memory that it was Alistair Laurie (from Dalbeattie, Dumfries, which I think may be in Scotland) who built and rode the bike, but also resulted in some photos of the bike that were taken by various people on the forum. 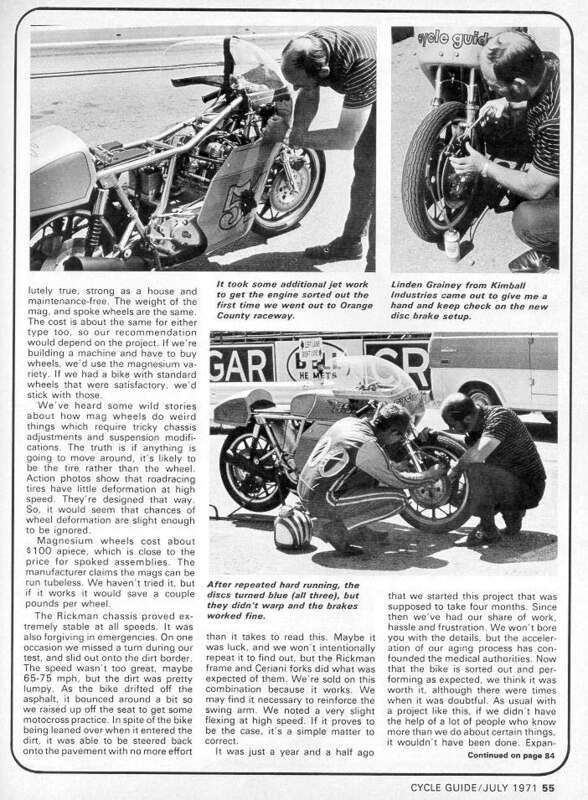 The article was from the August 1979 issue of BIKE, and was written by Dave Calderwood. 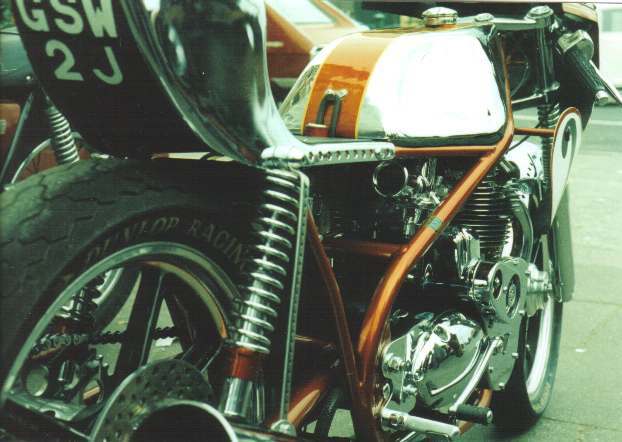 Laurie's bike had a custom crankshaft made from EN40 steel with a longer stroke of 80.5mm, as when combined with his own big-bore barrels the engine displaced 998cc. 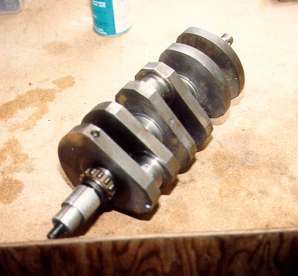 The crankshaft was nitrided and weighed in at 7.5 pounds less than the standard item (which is no lightweight). 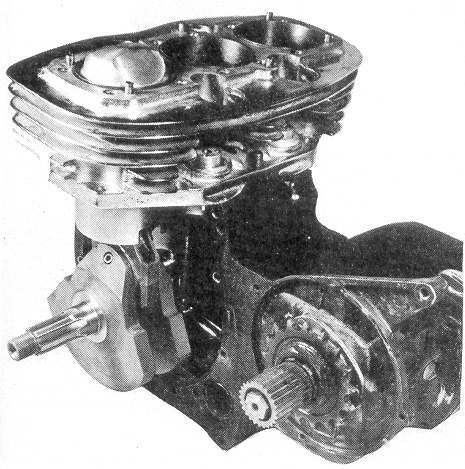 The engine also had tuftrided EN24 steel connecting rods with Cosworth F1 bearing shells. 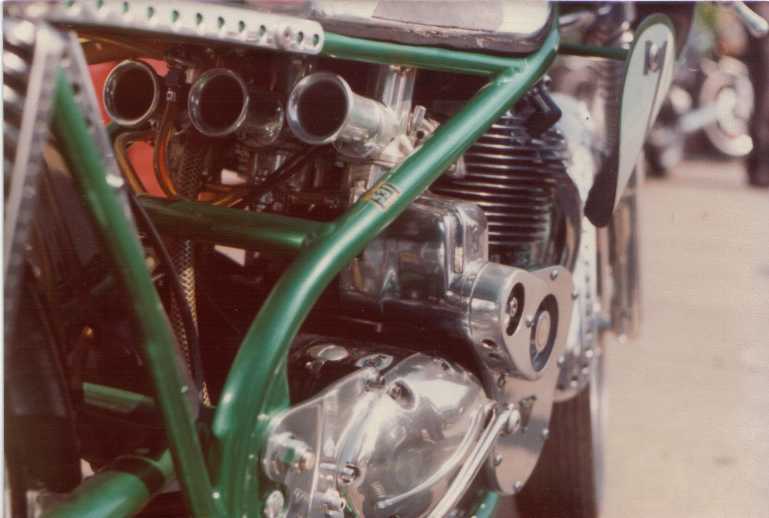 33mm Amal carbs, bigger valves and 1.625" exhaust headers. 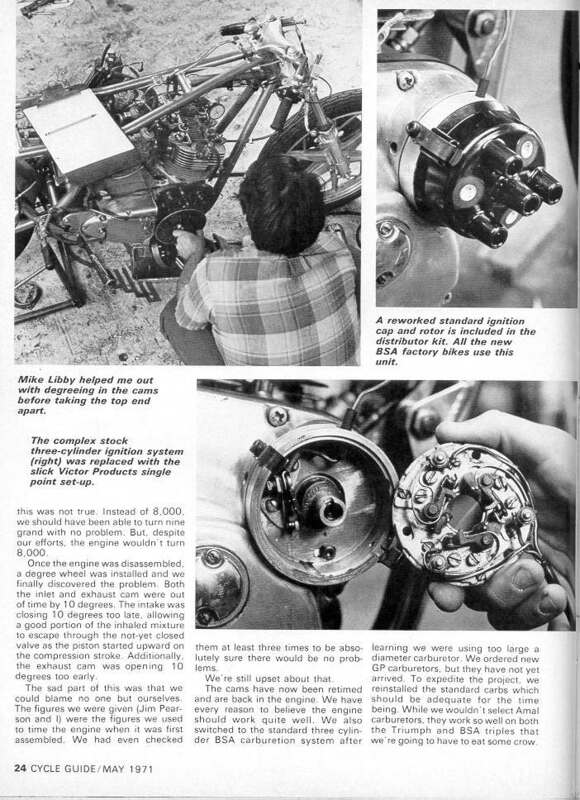 The bigger valves fouled each other so he had to reangle the guides in the head, and replace the valve seats. 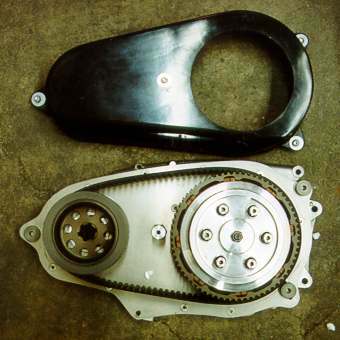 The crankcases had to be opened up for the bigger crankshaft, and then the rods were installed with the rod nuts tightened through the sump plate. 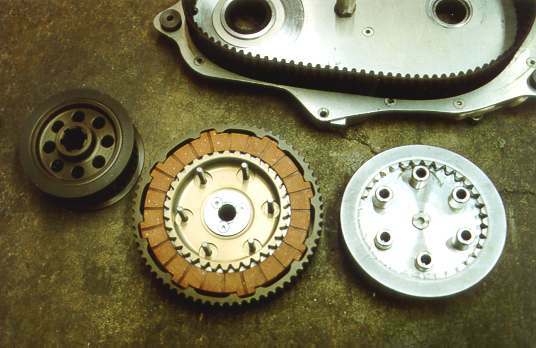 The two plate clutch uses his own sintered bronze driving plate. 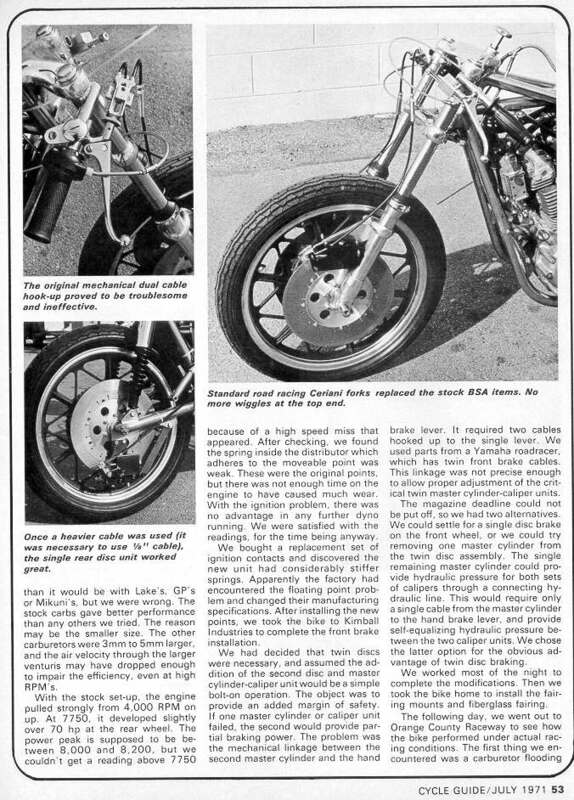 I recognized the wheels on Laurie's bike as being made by Eric Offenstadt, and since Tony Foale was the UK distributor for them I asked Tony if he remembered selling them to Laurie. Tony did, and he also told me: "I certainly do remember selling them to him. 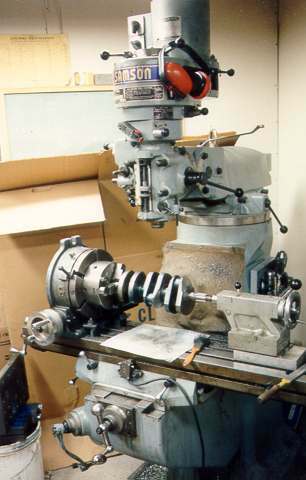 He had magnesium wheels and was the only person that ever came back and asked me to machine them thinner to save weight. 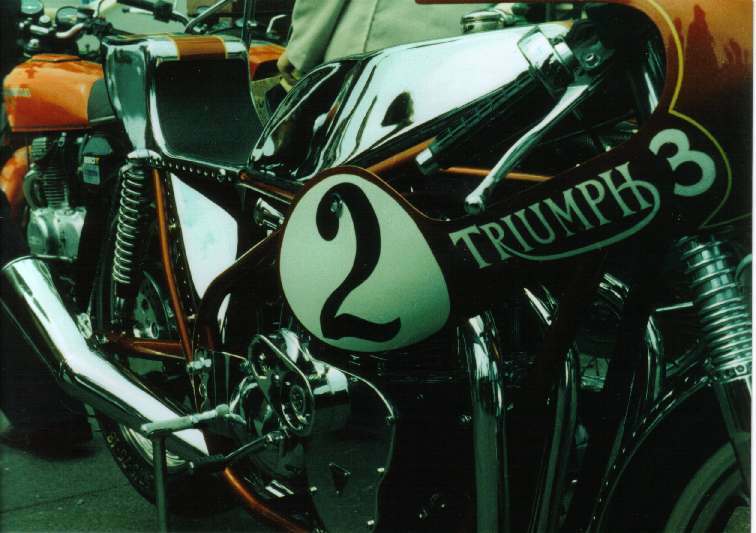 He was a great craftsman, he made the alloy tank and seat unit himself. I think that he wanted to break 200 mph. 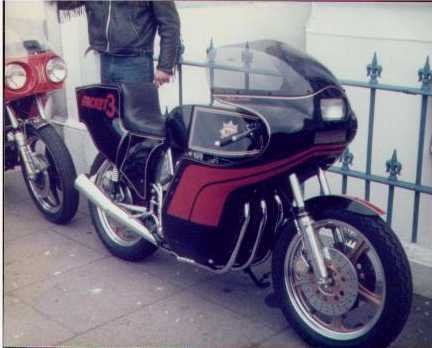 I have a vague recollection that he might have done it with a dustbin fairing. 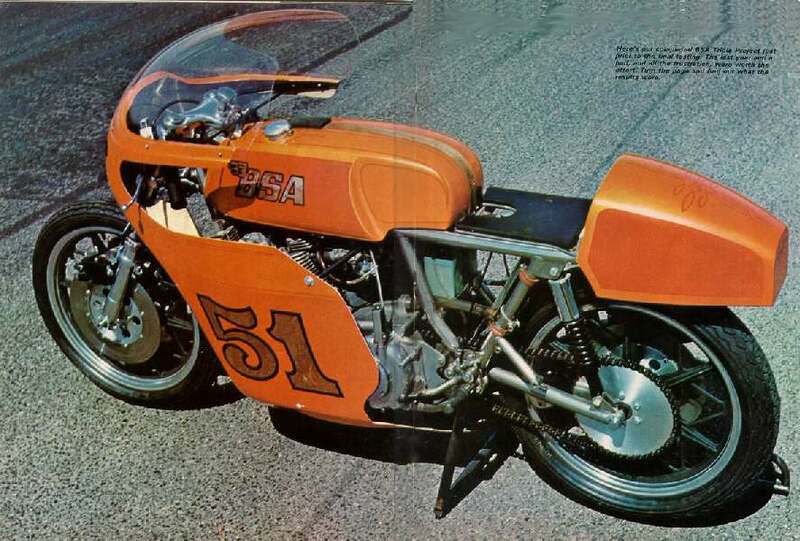 The bike ended up very light, even by my standards; he was fanatical about the weight of each piece." 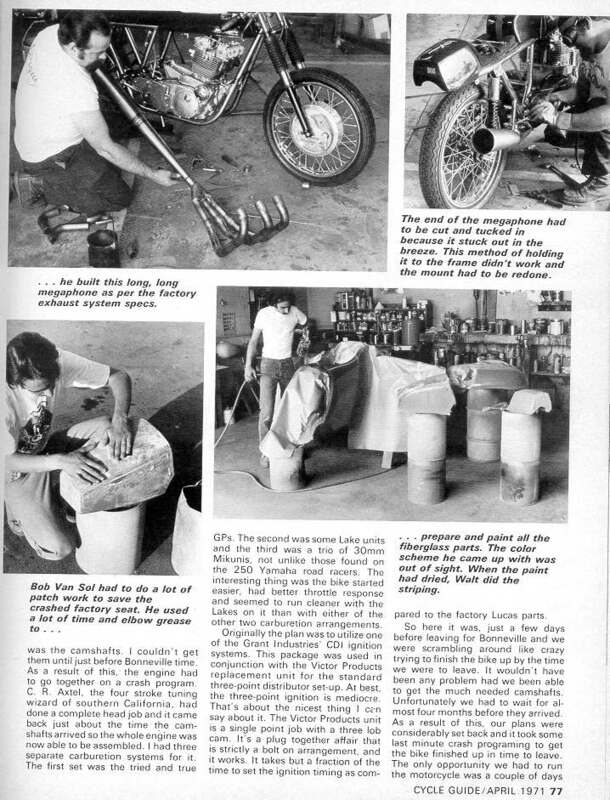 These are from the December 1972 issue of "Cycle" magazine, which included a shootout of the current superbikes. 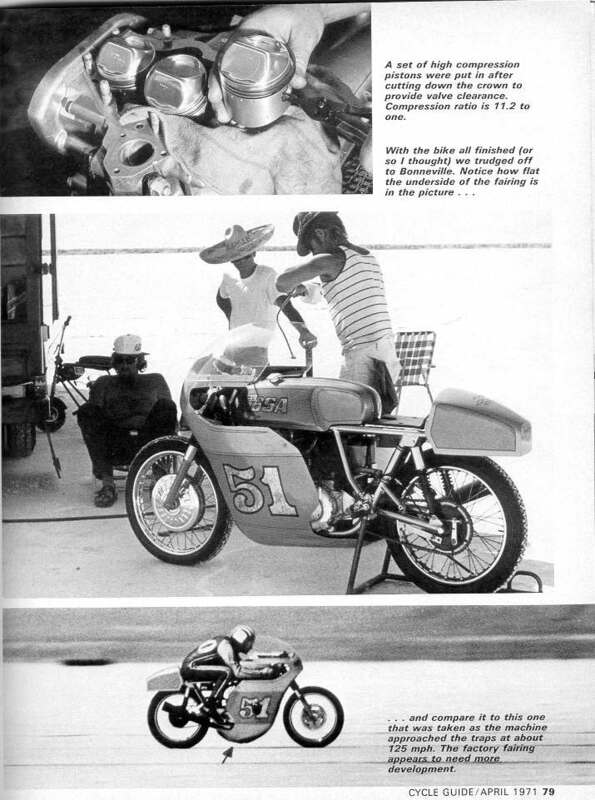 The Trident was third fastest (behind the Kawasakis) in the quarter, and also the third quickest. 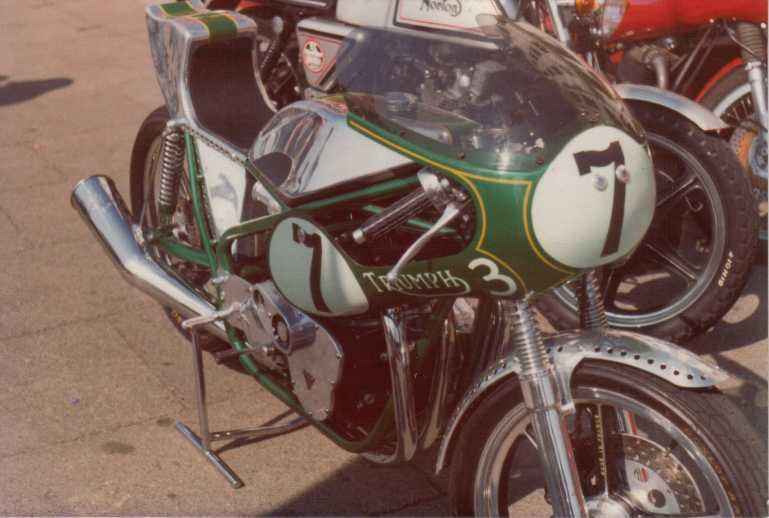 It was second worst in braking force (at .889G), had the third fastest (behind the Kawasakis) road course speed (.3 seconds ahead of the Norton), was fourth in pounds/bhp, third heaviest, and came out just ahead of the Norton in the overall points tally for third place (behind the Kawasakis). Malcolm Dixon                                   1.5"    30"      3"     1.75"   3.0"                Muffler -  4" x 2" x 24"
Malcolm Dixon                                  1.43"    25"      3"       2"    5.5"                Muffler -  4" x 1.5" x 26"
Philip Pick                                     1.5"    29"      4"       2"    none                Megaphone - 29" x 4"
works (as above)                                                        1.625"  4"
calculated - stock head/cam    53      7250    1.375"   27"             1.625"  12.5"               Megaphone - 29" x 4"
calculated - ported head/cam   53      7250     1.5"    27"             1.75"   12.5"               Megaphone - 29" x 4"
calculated - stock head/race   63      8600    1.375"   24"             1.75"   9.5"                Megaphone - 29" x 4"
calculated - ported head/rac   63      8600     1.5"    24"             1.875"  9.5"                Megaphone - 29" x 4"
calculated - stock head/cam    53      7250    1.375"   27"             1.75"   12.5"               Megaphone - 29" x 4"
calculated - ported head/cam   53      7250     1.5"    27"             1.875"  12.5"               Megaphone - 29" x 4"
calculated - stock head/race   63      8600     1.5"    24"             1.75"   9.5"                Megaphone - 29" x 4"
calculated - ported head/rac   63      8600    1.625"   24"             1.875"  9.5"                Megaphone - 29" x 4"
Consider starting with tubing a bit on the longer side, try that, and then start shortening. 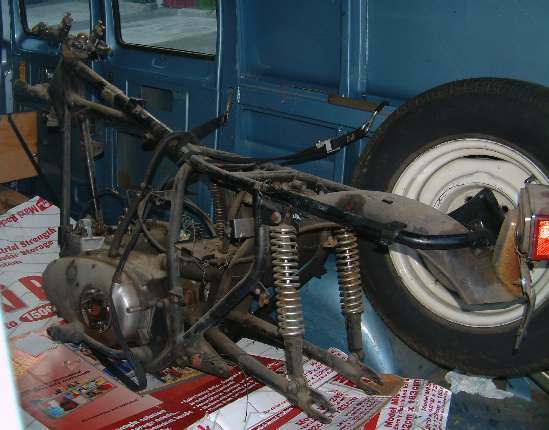 Be prepared to weld the chopped-off bits back on. 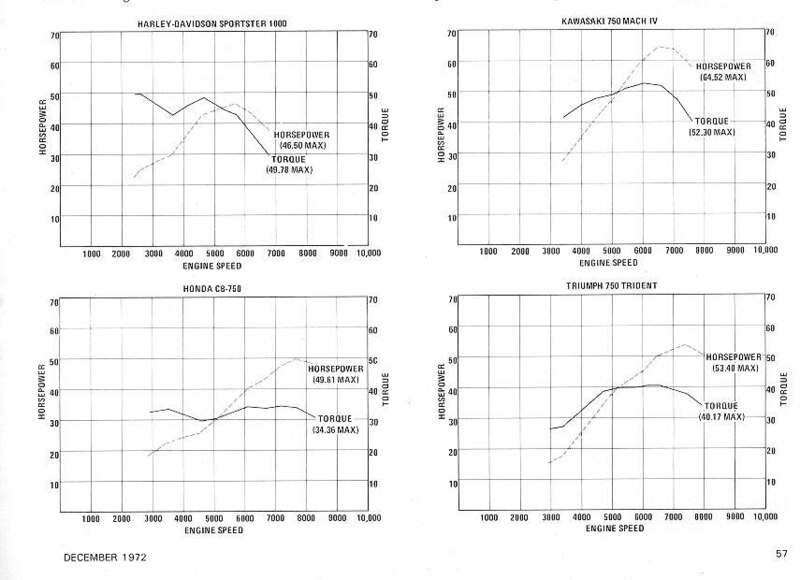 The calculated lengths usually provide a good over-rev capability in race use, so a realistic street system may well want to be a little longer. If you add length to the primaries, add a similar amount onto the secondary pipe. 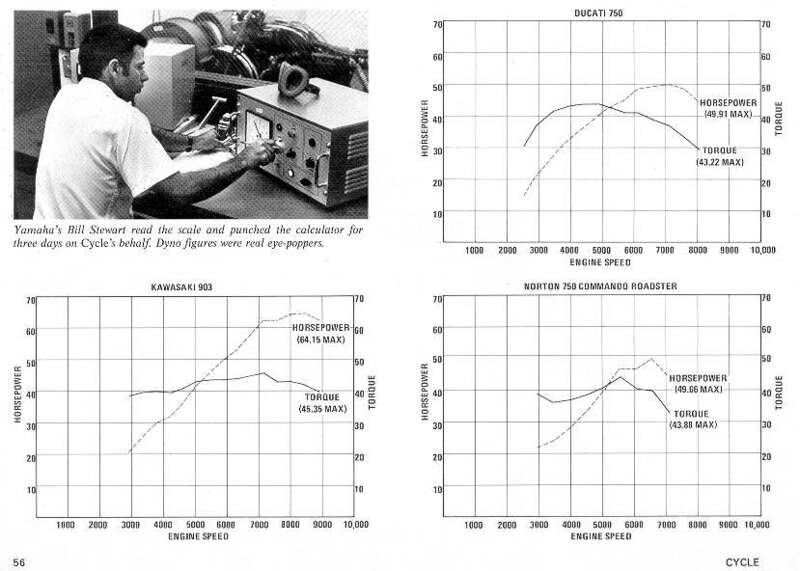 Angus comments: 6 bhp more than two rayguns but bad flat spot between 4500 and 6000 rpm. 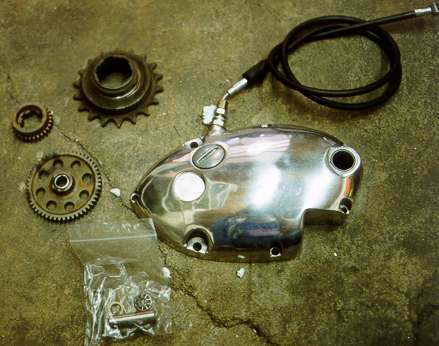 Everything else standard other than carb bellmouths.